I mainly purchase higher end makeup, however there are drugstore products that are firm favourites and ones I rely on daily. The Maybelline Fit Me Foundation is my favourite for when my skin is dry. It's the only one that looks amazing even if my skin is bone dry and you can't tell I'm having a bad skin day! It's very luminous and moisturising while giving medium coverage which looks very natural on the skin. 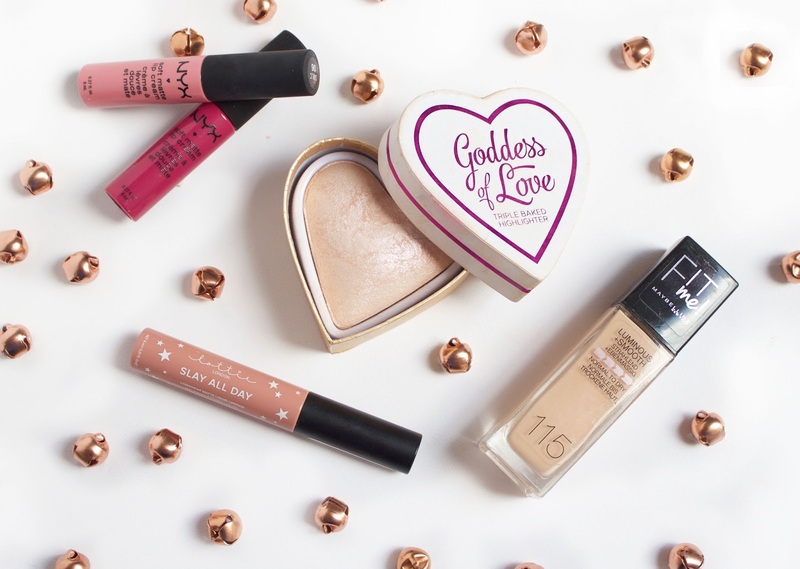 Another favourite that makes my skin look glowing is the I Heart Makeup Goddess of Love Highlighter, I have two of these shades and adore them both. They are so affordable, you get a lot of product for your money and they come in the prettiest shades too. Also, the packaging is really pretty! There are two lip products from the drugstore that I rely on, the Lottie London Matte Liquid Lipstick comes either separately or in a lip kit. Personally I absolutely adore the lip kits, the lip liner is really soft and easy to apply while the liquid lipstick dries matte but is still comfortable on the lips. Another drugstore lip favourite is the NYX Soft Matte Lip Cream, I own so many shades of these and they're all amazing. I love how moisturising they are on the lips, how vibrant the colours are and how long they last. What are your drugstore recommendations?